Everyone has their gadget preferences, and I’ll be the first to admit that some of my favorites are of the low-tech variety, including these two recent acquisitions. First up is a salad spinner fiber spinner that I bought after using one at the dye workshop in April. I tracked it down at Wal-Mart, after checking other discount department stores. Apparently, not a lot of people use them for their intended purpose, but spinner/knitter types are evidently not the only ones to come up with alternative uses for these handy little centrifuges! 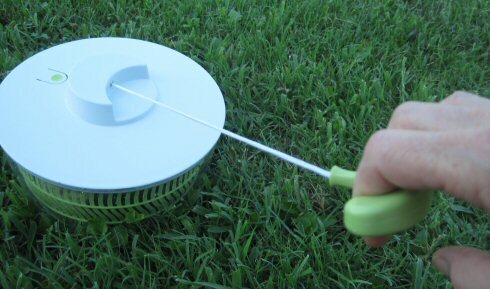 This use of the lowly salad spinner, ripped from today’s headlines (well, maybe last week’s headlines) may turn out to be critically important, even lifesaving, while my use is only a small convenience. Turns out, it makes a handy-dandy little spin-dry device for small amounts of unspun fiber, yarn and small items like socks or lingerie. 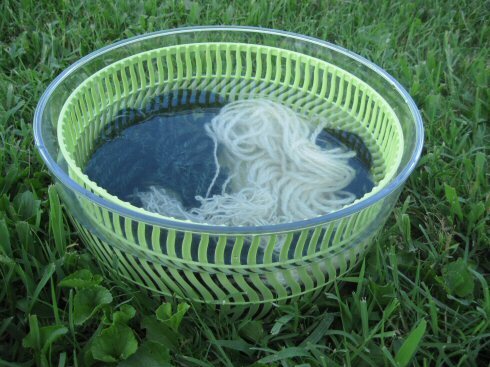 The basket also makes it ideal for washing wool, since it supports the wet wool as it’s being lifted out of wash water, then waits to be lowered again into fresh rinse water. Then just lift it out of the water, empty the bowl, and put it all back together with the lid, and give the handle a few good yanks! Ta da! Fluffy damp yarn (or fleece or socks) instead of drippy wet yarn (or fleece or socks). Nifty, huh? 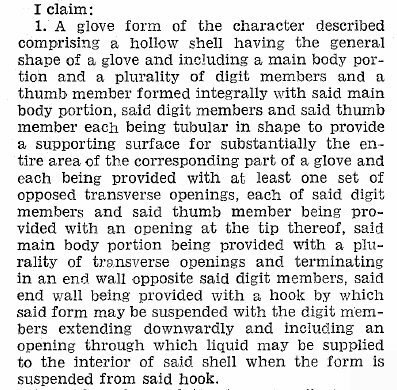 My other recent purchase was from a garage sale – a mint-condition pair of glove forms, in the original box, with instructions! This little gem was patented in 1950, when gloves were de rigeur for ladies at all dressy occasions. Let me guess… you would have recognized these in a heartbeat after reading THAT, right?? Actually, I was interested to find the patent online, and have a look at the sketch with all its numbered parts and descriptions. In a nutshell, the idea is that you slip your gloves over these babies, then do any mending needed, wash them and hang to dry, still on your Glov-Trees, then take them off ready to slip on your own delicate hands in time for your ladies’ circle meeting! Nowadays, of course, we only wear gloves for warmth or protection, but I could not walk away from the garage sale without buying them – for $1. I still plan to spin that alpaca wool and knit some Fair Isle patterned gloves, and now I have just the right gadgets to help keep them looking beautiful!